The Impossible, a movie starring Naomi Watts and Ewan McGregor – based on the true story of a family’s experience during the 2004 Indian Ocean tsunami, contains a key sequence that PhotoModeler helped produce. The film won a 2013 Visual Effects Society Award: “Outstanding Supporting Visual Effects in a Feature Motion Picture”. It is the very first time Spanish film has won a VES award. As well on Feb. 16, 2013 The Impossible won a Goya (Spanish cinema awards) for best Visual Effects. As well the lead actor, Naomi Watts, was nominated for a 2013 Best Actress Oscar. The key special effects were produced by El Ranchito, a special effects house in Madrid Spain. The photogrammetry effects supervisor, Magoga Piñas, is shown below in a photo. 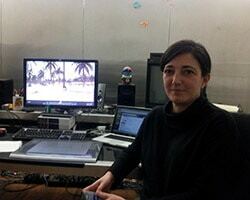 Magoga Piñas has spent 20 years working in the world of 3D. Previously she studied law, but when she discovered computers, “I fell in love with them and went to study in Los Angeles to specialize in 3D.” Besides having her own studio, she works at El Ranchito, a company dedicated to the post-production and visual effects for film and advertising. El Ranchito was responsible for producing the visual effects of The Impossible. Magoga was the person responsible for supervising the work in 3D and filming assistance. Magoga was aware that PhotoModeler was known throughout the world of archaeology and museums. “In the film world, it is common to use photogrammetric techniques“, she said. PhotoModeler was a key to completing the visual effects of The Impossible: for finding the camera movement along the fixed points of the scene, or to track points standing as benchmarks in a very complex sequence where all elements are in motion. PhotoModeler was used, along with many other programs during the post-production. Magoga was responsible for the environment models: “the flood”, and The Orchid Hotel using PhotoModeler. The part of the film with most visual effects work is called “the flood”. The force of the water draws the characters more than a mile inland in a gripping sequence that lasts about 8 minutes. The action of the actors was filmed in a water tank in Alicante, where the special effects team used powerful pumps to create a channel of water about four feet wide by about 25 long. Using digital techniques, the strip of moving water was added to 2D layers of water bodies, footage from Thailand, and generated 3D layers such as vegetation and dragged items. To composite all these layers, it was necessary to very accurately reproduce the movement of the camera on the computer. For the director Juan Antonio Bayona, it was essential to move the camera freely in the sequence to get the correct emotive response. Sequences were shot with different cameras that were always moving, many of which were hand held. There are programs that infer the camera movement along the fixed points of the scene, or to place track points as reference marks. But in this case the problem was that all the water was in motion. To attempt tracking, heavy concrete abutments were placed inside the tank, and points on the edges and the back wall were used. These were insufficient to deduce camera motion automatically in other programs. However with PhotoModeler it was possible to obtain very precise measurements of each of those marks in the three-dimensional space, and generate accurate basic geometry. This data, and the reference 3D model, were fundamental to supply the 2D and 3D software programs additional information necessary to fine-tune real camera movement. The photos were used to model the tank used to recreate “the flood”. They were taken at different times of the day to avoid direct contact with sunlight. The first two show the tank being modeled in PhotoModeler, and the third image shows the tank 3D model in the other modeling software with tracking points. Another important scene in the movie is at the Orchid Hotel where the family was staying. The hotel was severely affected by the actual tsunami in 2004. At the time of the shooting, the building was fully restored. It was therefore necessary to replicate the hotel in 3D to simulate the arrival of the wave, and to shoot a sequence in which the hotel appears devastated after the passage of water. For the visual effects supervisor Felix Berges, maintaining the highest levels realism was a priority. To achieve this, the 3D version of Orchid Hotel was integrated in post-production with the real version of the same shot whenever possible. To mix the real and the digital, the 3D replica had to have very precise measurements and proportions. Another difficulty was that there were no construction plans, or blueprints for the hotel. They took a series of photos to generate a 3D reference model in PhotoModeler. The program was able to generate the overall structure of the building’s very basic geometry with great precision. Based on this reference model, the highly detailed final model was created in external modeling software. Two versions were made; one with the site intact, which appears in the sequence of the wave impact, and another with a simulation of the hotel as it was when devastated, which appears in a sequence where the father searches among the ruins for his family.